Students who are looking for ways to become a music teacher have a number of great educational options available, depending on their state of residence and where they wish to teach this subject. Whether it’s a specific music education program or something that’s a bit more creative in terms of its design, learning how to turn musical skill into musical instruction is something that many of today’s colleges and universities have long assisted with. As with all teaching professions, getting into this specific area requires the right combination of education and official licensure, which is a pretty rigorous process in an era of high state standards, tough PRAXIS exams, and high GPA requirements. With those things understood, here’s a look at how to successfully land a position teaching music to today’s kids. Many starts in the northeastern part of the country have developed education majors with a specific content area integrated from the start, which eliminates the confusion of choosing major and minor courses, satisfying a long list of prerequisites, and potentially ending up a year behind in terms of final graduation. Music education degrees combine music classes with a number of courses that teach child psychology and learning styles, classroom management, curriculum development, instructional philosophies, and lesson pacing. This unique degree program automatically qualifies students for PRAXIS examination in the music field, as long as they meet minimum GPA benchmarks in advance. With a passing PRAXIS score, certification by the state board is likely to follow shortly after graduation. 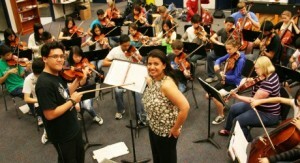 A music education degree typically qualifies graduates to teach the subject at both the elementary and secondary levels. This might be ideal for those who don’t mind teaching younger children, but some musicians will simply want to work with older kids that have already learned the basics. That’s where this program comes in. This approach is a bit more traditional than the one above, with a full major in music and only a minor in education. As part of this program, students focus primarily on the education of adolescent students in the upper middle grades and in high school. They’ll still complete a student teaching placement, take the PRAXIS exam, and be eligible for state certification, but their eventual teaching license will typically only cover grades 7-12. Some students initially finish a degree in musical performance with the hope of working for one of the world’s most prestigious orchestras or symphonies. Unfortunately, this field is quite competitive and not everyone can land such a job. Many states allow music graduates to enroll in a graduate-level education program that adds in all of the necessary skills for lesson planning, classroom management, pacing, instruction, special accommodations, and other essential skills. Students are encouraged, but not required, to teach at a high school during this degree program. After they graduate, students can opt to either take the PRAXIS exam for secondary education licensure, or they can choose to teach as an adjunct at community and liberal arts colleges nearby. There are a large number of pathways into the world of music education, according to College Board. Whether it’s a specific major in this pursuit, a minor in education while studying music, or even achieving the same goal through grad school, those who wish to teach can choose any number of ways to become a music teacher as they study and perform.